Here's a sto­ry of the ori­gins of the urban preser­va­tion and revi­tal­iza­tion move­ment. In yesterday’s below-freez­ing tem­per­a­tures and brisk wind we walked the two blocks, 1400 feet, of the urban park that is Mil­wau­kee Avenue in Min­neapo­lis. Our sub­ject neigh­bor­hood began life as an alley (1880), became 22 ½ Avenue (1883), peti­tioned for re­des­ignation as Wood­land Avenue but for rea­sons unknown was re­christened Mil­wau­kee Avenue (1906), de­clined due to neglect (1930s-1950s), was col­o­nized by hip­pies (1960s-1970s), faced raz­ing and re­develop­ment (1970), inspired one of the first activist col­lec­tives bent on urban preser­va­tion (1970s), was added to the Nation­al Reg­is­ter of His­toric Places (1974), was com­pre­hen­sive­ly revi­tal­ized and closed off to traf­fic (1970s-1980s), and is today one of the most sat­is­fy­ing walk­ing neigh­bor­hoods in the Twin Cities. Despite its appear­ance as a tourist attrac­tion, peo­ple live on Mil­wau­kee Avenue. By one reck­on­ing the val­ue of their homes is 31% high­er than that of larg­er hous­es on a com­pa­ra­ble neigh­bor­ing street. Some of that added val­ue comes from the appeal of the pedes­tri­an-only street, and some is down to its his­tor­i­cal des­ig­na­tion at local, state, and fed­er­al lev­els. One of the res­i­dents is Bob Roscoe, who was at the cen­ter of the 1970s move­ment to save this neigh­bor­hood from the wreck­ing ball. His 2014 book, Mil­wau­kee Avenue: Com­mu­ni­ty Renew­al in Min­neapo­lis, doc­u­ments the birth of the urban preser­va­tion and renew­al move­ment from the inside. Mil­wau­kee Avenue was born in the greed of 19th-cen­tu­ry real estate agent William Ragan, who had a gam­bling prob­lem, accord­ing to Roscoe’s book and this inter­view he con­duct­ed last year with Streets​.mn. Ragan need­ed to extract the max­i­mum prof­it from the alley he pur­chased between 22nd and 23rd Avenues, just off Franklin, in what is now the Seward neigh­bor­hood of Min­neapo­lis. He hit upon the idea of build­ing what we would now call medi­um-den­si­ty urban hous­ing on quar­ter-sized lots. To save mon­ey Ragan used the same blue­print for all the hous­es. He faced them with brick, an unusu­al move for the time in low-end dwellings, and added iden­ti­cal gin­ger­bread to the porch­es and peaks of all the hous­es. With no front yards, 15-foot lot clear­ance on one side only, iden­ti­cal­ly pitched roofs, and most­ly brick con­struc­tion, the prop­er­ties look almost like row hous­es. 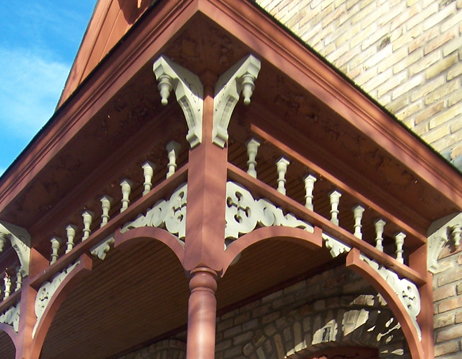 In his book, Roscoe suc­cinct­ly describes the archi­tec­tur­al facets that give the street its vari­abil­i­ty with­in uni­for­mi­ty and its uncom­mon sense of bal­ance. He notes that the rooflines of all the hous­es on the east side of Mil­wau­kee Avenue were built to the same ele­va­tion, even as the ground drops 3 feet on its 2-block run north to south. A cer­tain inti­ma­cy is con­veyed by the nar­row (25') for­mer one-way street that is now a pedes­tri­an mall with cen­tral plant­i­ngs. The first occu­pants of 22 ½ Avenue were North­ern and East Euro­pean work­ing­men and their fam­i­lies. By the time the city decid­ed to raze the lot of them in the 1970s, some of the hous­es had been occu­pied by the same fam­i­lies for well over half a cen­tu­ry. But some housed artists, roots blue­grass musi­cians, hip­pies, and vet­er­an activists protest­ing the Viet­nam war. When these ener­getic young peo­ple learned of the city’s plan to lev­el their neigh­bor­hood, and 35 blocks all around them, they decid­ed to “stick it to the man” in City Hall. The city took no heed of the noise raised by the orga­ni­za­tion they had formed, the Seward West Project Area Com­mit­tee, so the activists went over their heads by qui­et­ly apply­ing to the Nation­al Reg­is­ter of His­toric Places, and in 1974 the Mil­wau­kee Avenue His­toric Dstrict was born. Was just talk­ing about this street with my wife this week. I vol­un­teer my street for this, though I'm guess­ing it would be much more dif­fi­cult. 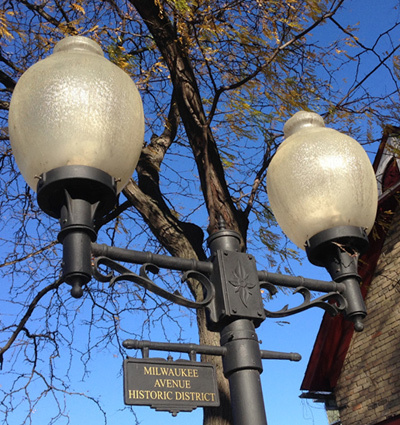 Our lit­tle sec­tion of Mac Grov­e­land doesn't have a park with­out cross­ing Grand, St. Clair, Snelling, or Ham­line. Let’s trans­form one of the streets in this way!